Waddesdon, Waddesdon Manor, inv. 881. London, collection of Baron Edmond de Rothschild (1845-1934). By descent to his son James de Rothschild (1878-1957); accepted by The Treasury Solicitor in lieu of taxes on the Estate of James de Rothschild in 1963; given in 1990 to Waddesdon Manor, The Rothschild Collection (The National Trust). Dacier, Vuaflart, and Hérold, Jean de Jullienne et les graveurs (1921-29), 1: 263, cat. 139. Waterhouse, Rothschild Collection (1967), cat. 138. Although presently listed by the museum as possibly having come from the comtesse de Verrue’s collection, that would be possible only if this were Watteau’s original painting, which is most definitely not the case. Learning of the Waddesdon picture only late in the course of their publication, Dacier, Vuaflart, and Hérold thought it was the original but it is probable that they did not actually see it. Almost a half century later, in the 1960s, Waterhouse rightly demoted the painting and classified it as “after Watteau.” Indeed, it is not a work of quality. The faces, for example, are rendered poorly. 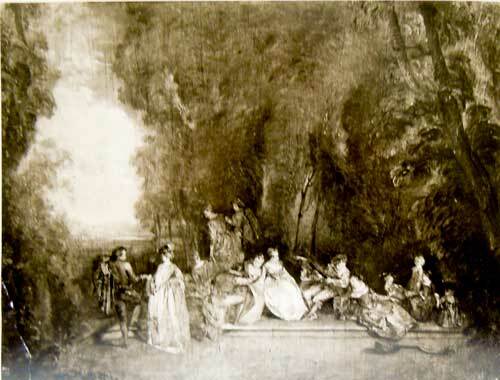 Unaware of the many versions of this composition, Waddesdon Manor has also suggested that their painting might have come from the Rochard sale in 1858 (our copy 5), which is not unreasonable, but we have no image of that version or even its measurements. 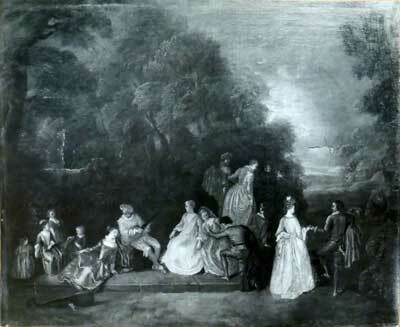 Although this version of the painting has been neglected by cataloguers of Watteau’s oeuvre (Adhémar as well as Montagni and Macchia), it is singularly important because it was copied directly from the Verrue picture. This is revealed in its left-right orientation, whereas the other versions are based on the Le Bas engraving. 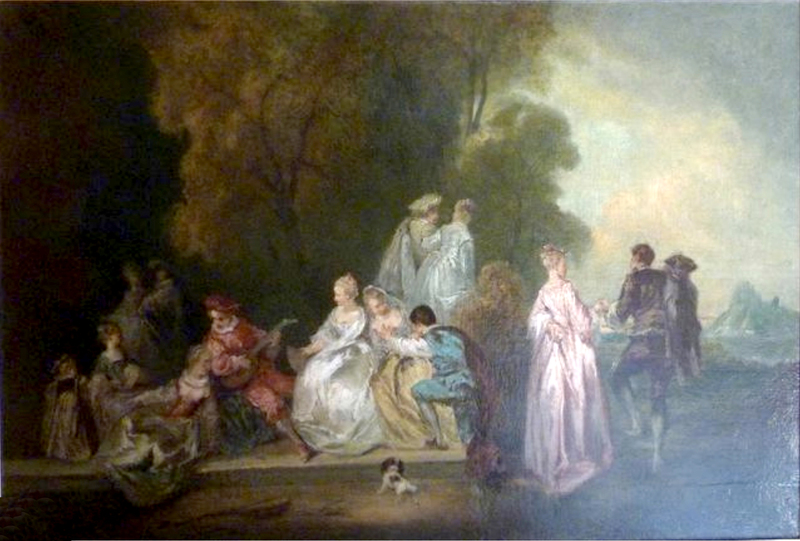 So, too, the Waddesdon painting copies the colors of Watteau’s original painting. The colors of the characters’ costumes at the right side of the composition match those of the corresponding figures at the right side of the Récréation galante in Berlin and these were undoubtedly the colors present in the Verrue painting. 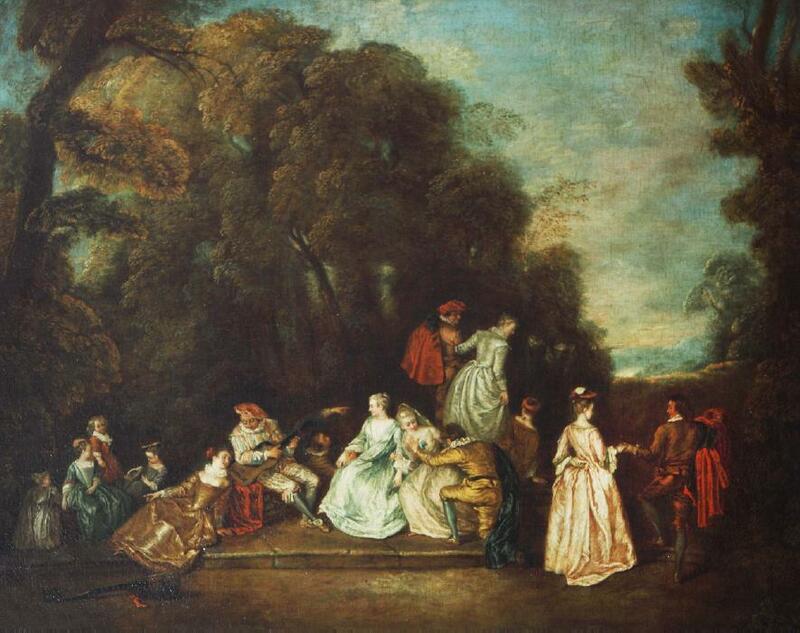 However, in one respect, the Waddesdon version is unlike Watteau’s original picture and the other extant copies: it is noticeably larger than the presumed size of Watteau’s painting. Schwerin, Staatliche Museen. This and forty-seven other paintings, all classified as copies, were given on June 15, 1920 to the Berlin auction house of Rudolph Lepke to be sold for the benefit of the museum. Schlie, Beschreibendes Verzeichniss (1882), cat. 591. Schlie, Kurze Verzeichniss (1890), cat. 591. Dacier, Vuaflart, and Hérold, Jean de Jullienne et les graveurs (1921-28), 1: 263, under cat. 139; 3: under cat. 139. Wildenstein, Lancret (1924), cat. 135. Adhémar, Watteau (1950), under cat. 187, cat. 238. Waterhouse, Rothschild Collection (1967, under cat. 138. Macchia and Montagni, Watteau (1968), under cat. 171. Hegner, Replik & Massenware Schwerin (2012), 82-83. One can wonder if this painting was not attributed to Watteau at some point in the eighteenth or early nineteenth centuries. By the late nineteenth century it was attributed to Lancret. In 1882, Schlie suspected that it was not an original work by him but, rather, a skillful copy. Confusing the issue, he related it stylistically to paintings by Pater in the Louvre. At that time, Schlie offered a full description of the composition. It showed a terrace with three couples. At the left a man knelt before a woman, declaring his love for her, then there was a woman with a fan listening to a man with an upraised arm, and a man playing a guitar while looking in a music book held by a woman. At the right is a group of four young girls, and a couple preparing for a dance. To the right of them a group was shown walking off, and there was a woman lying on the ground, her back turned to them. This description corresponds exactly to the composition of the comtesse de Verrue’s L’Assemblée galante. In 1890, Schlie again catalogued the Schwerin painting under Lancret’s name but this time did not deny the attribution to him. On the other hand, he discussed the painting’s relation to Watteau’s oeuvre. Unfortunately, he did not correctly identify the painting’s source as the Verrue picture but, rather, the closely related painting in Berlin, Watteau’s Récréation galante. Some four decades later, in his monograph on Lancret, Wildenstein catalogued the Schwerin picture as though it were by that artist but, on the other hand, he declared that he saw nothing of Lancret in the work. Wildenstein had undoubtedly not seen the painting or even a photograph of it but, on the basis of Schlie’s detailed description in 1882, he recognized that the composition matched the comtesse de Verrue’s L’Assemblée galante. He reported that Steinmann, director of the Hertziana Library in Rome, remembered having seen such a picture in Schwerin but also did not believe it was by Lancret. So, too, Waterhouse described the picture as “rather doubtfully ascribed to Lancret.” Nonetheless, the association with Lancret has continued in the Watteau literature, as in the entries by Adhemar as well as Montagni and Macchia. It must be emphasized that these twentieth-century scholars were drawing conclusions about a painting they had never seen, not even through secondhand sources. As we now know (and I am grateful to Dr. Tobias Pfeifer-Helke for this information), the painting was de-accessioned by the museum in 1920 and disappeared from public view. Unfortunately, it cannot be matched with any of the extant copies of L’Assemblée galante. Even in the eventuality that is found, it is unlikely that this copy will prove to have been executed by Lancret or any other specific Watteau satellite. Belgium (? ), collection of General Morel. Brussels, Galerie Jacobs, in 1956. This picture is known through photographs in the Frick Art Reference Library and the Service de documentation, Département de peintures, Musée du Louvre . As its left-right orientation reveals, this version is a copy after the Le Bas engraving. Munich, Hampel Fine Art Actions, Sale, June 30, 2006, lot 367: “Jean Baptiste Pater . . . zug., Gemäldepaar: GESELLSCHAFTEN IM PARK Öl/Holz. 32 x 43 cm. Gerahmt . . . Estimate: €35,000.- “ Sold for €25,000. Munich, Neumeister Kunstauktionen, Sale, March 12, 2008, lot 737: “PATER, JEAN-BAPTISTE . . . (Nachfolge, wohl 19. Jh. Fêtes champêtres. Zwei Gegenstücke. Ein Gemälde r. u. bezeichnet >> J. Ba. Pater [ . . . ]<<. Öl auf Holz. Je ca. 30,5 x 42 cm. Rest. Besch. – Rahmen besch. (47388) EUR 17,000,-“ The pair of paintings did not sell. This is one of two pendants wrongly attributed to Pater or to a nineteenth-century follower of his. However, this picture is merely an anonymous copy after Le Bas’ engraving of Watteau’s L’Assemblée galante, made in response to the market’s taste for fêtes galantes. The signature claimed for one of the paintings in 2008 (but not previously cited in the 2006 sale) is patently spurious. Anonymous copy after Nicolas Lancret, Le Repas italien, oil on panel, 30.5 x 42 cm. Whereabouts unknown. In fact, the second of the two pendants is nothing more than a copy after Jacques Philippe Le Bas’ engraving of Lancret’s Le Repas italien. Paris, collection of M. Rochard. His sale, December 13-14, 1858, lot 65: “WATTEAU (ANTOINE) . . . L’Assemblée galante.—Cette belle composition a été gravée par Lebas et provident de la collection de la comtesse de Verue.” Sold for 240 francs to La…ville. Dacier, Vuflart, and Hérold, Jean de Jullienne et les graveurs (1921-29), under cat 129. Without an image of this work, and without knowing its measurements or whether it was on canvas or panel, it is not possible to proceed further in trying to identify it with any of the extant versions. Dacier, Vuaflart, and Hérold, Jean de Jullienne et es graveurs (1921-29), under cat. 139. This picture’s left-right orientation—described in the 1880 sale catalogue—reveals that this version was a copy after the Le Bas engraving. London, collection of Christopher Beckett Denison (1825-1884; politician). His sale, London, Christie’s, June 6-July 15, 1885, lot 1054: “J. D. [sic] PATER . . . A FÊTE CHAMPÊTRE / 19½ x 21½ in.” Sold to Child according to Christie’s’ own annotated copy of the catalogue in the National Arts Library, Victoria and Albert Museum. Ipswich, collection of John Ganzoni, 1st Baron Belstead (1882-1958; politician). This painting is known through a photograph in the Getty Research Institute. Apparently the picture traveled under an attribution to Pater in the nineteenth century. 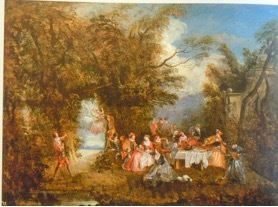 As is evident, it is only an anonymous crude copy but it follows the right-left orientation of Watteau’s original painting. Marseille, Tuloup-Jullien et L'Étude de Provence - Ribiere & Tuloup, Sale, May 6, 2018: "Ecole française du XIX°, à la manière de Jean-Antoine WATTEAU (1684-1721), Scène galante au ménestrel à l'orée du bois, HST, 69 x 107 cm. ESTIMATION / 300 - 350 €. " 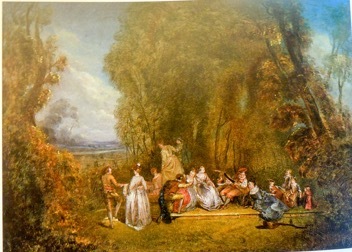 Although classified only as “manner of “ Watteau, this picture is a direct copy of the master’s Assemblée galante, in the same direction as the original painting. However, unlike the version at Waddesdon Manor (our copy 1), this copyist created his own color scheme for the costumes, took liberties with the landscape, and may have changed some figures at the left.